As an Asian, we always crave for spice and herbs in our foods. So mostly Middle eastern cuisine give us a bit tough time for being low in spices. Studio Last is among those that will not disappoint an Asian.you can order a spicy or extra spicy grill and Viola! Huge variety of chicken, beef, mutton grill, and kababs are on the menu. Add on spice and addition of some hot sauce give their grills a delish taste and aroma. Ample platter of grill meat served with the grill vegetables and fries( definitely I left for my kids as my healthy eating plan) is enough for a power meal.I selected four different platters for four of us and none of them was less in taste. Leabet El Set(boneless grilled chicken): This was the best chicken, so soft and juicy and delicious. All these items were served with grill tomatoes.🍅🍅, grill onions and green chillies🌶🌶🌶🌶. Somebody told me that the plates are named after famous Egyptian movies of their time. That’s another interesting fact.You can see the photos of the movies on the walls around,representing their theme cleverly. Before the order, they served their complimentary bread. OMG! that’s so amazing little fluffy soft bread; a mix combination of chappati+khubazh+ bread! It was so soft and fluffy as it sustained its shape for long. That gave us a very good start with pickles and sauces! Why should you visit STUDIO MASR? 1.perfect in taste and aroma even for Asians. 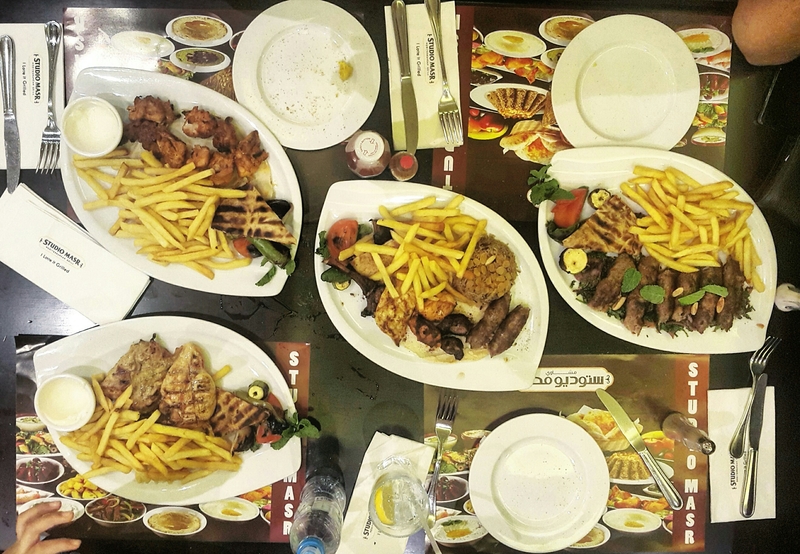 2.huge middle eastern grill menu. Sitting Area is huge and services are good!!!! They have also a big variety of middle eastern desserts and drinks. For their Official website plz check!